I'm quite often on my own as my boys are at their dad's alternate weekends and are unable to join me then. We're one big wednesday family Maxine. Don't let it stop you. Well done Wednesday. My kids enjoyed this at end of last season. A few appearances from some fringe players too. Glad to see they've carried it on. Has the law changed? I thought it was only illegal to park on pavements in London. Elsewhere, as long as you don't cause obstruction on the pavement and are not parked too close to the junction (10 metres?) I thought it was ok.
At least we know they're in the country this time so shouldn't have to wait too long for them. Normally I don't bother, but was considering getting me self one this year. Ladies are on sale of course, so I could still do it but I don't think my boys would too happy seeing me in one when they can't have one themselves. 2 disappointed boys this morning. 30 seconds in, price tag shows small man's size at £59. Does that mean that the replica kit will be available tomorrow? Or does your name need to be chansiri to be in with a chance? 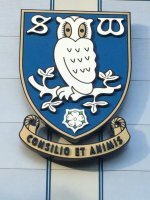 Was the #SWFC WAWAW Fun Day unappreciated? We had a great time although I have heard a few negative comments myself. I get that it would have been more accessible if it had happened last week, however thought it might have been this week to allow the pitch time recover before out next match. Although there wasn't a lot of stuff going on in the car park, with the treasure hunt and 2 hrs pitch time for the kids (different age groups), I felt the day was full already. Like u say though, people want something for nothing and then some so still find reason to complain. My youngest is so excited to be playing on the hallowed turf. Booked in for the treasure hunt at 10.15 too. Not sure which stands are being used but I've dealt with 2 very helpful ladies whilst sorting out my time slots, so I'm sure they'll be most helpful if you give them a call or email them. Lindsey Taylor and Katie Rippon are who I've been dealing with. sorry to hear your sad news @Spencerowl If it helps any, I have previously bought a ST from a fellow owl on here and, as I wanted to switch the ticket from the kop to north stand, I had a small fee to pay which was basically the ST price difference between kop and north prices for the remaining games. The ticket office just needed written confirmation from the original holder stating that they were transferring it to me. Wishing you and your family well and I hope you're able to sort something out. Is the time on the clock the same as when the clock stops on the promo video? What's the significance? Any ideas?